I don't get it. Why do so many liberals still love John McCain? He's anti-choice and anti-gay and a true conservative Republican in many other ways as well. 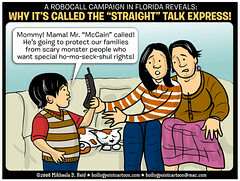 Boo to John McCain! We care deeply about traditional values and protecting families. And we need someone who will not waver in the White House: Ending abortion, preserving the sanctity of marriage, stopping the trash on the airwaves and attempts to ban God from every corner of society. These issues are core to our being. "Mitt Romney thinks he can fool us. He supported abortion on demand, even allowed a law mandating taxpayer-funding for abortion. He says he changed his mind, but he still hasn’t changed the law. He told gay organizers in Massachusetts he would be a stronger advocate for special rights than even Ted Kennedy. Now, it’s something different. "Paid for by John McCain 2008. God, they just make me want to bite someone (in a bad way). LAST LAST LAST LAST LAST! A Republican Reader Asks: Why the Tunnel Vision?